These cost efficiency claims don't line up with studies of cost efficiency that the Bismarck Alliance for Neighborhood Schools was able to find of other districts in the nation. 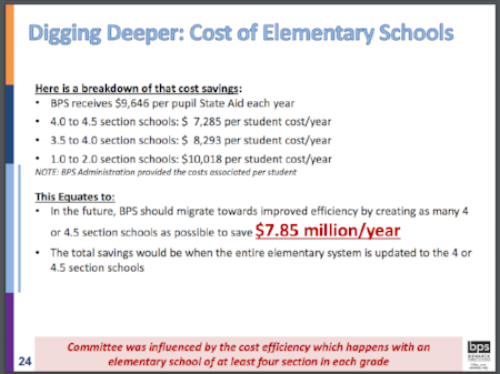 We have been very curious why Bismarck's cost savings would be so much greater than other districts. Beginning in June, our Alliance has been asking the BPS administration to "show their work," just as any math teacher would do. Assuming these cost per student numbers were generated based on actual costs and actual enrollment in Bismarck Public Schools, we asked for the data and the calculations supporting the numbers above. Our Alliance did receive information in late August, but when we started to "dig in" to understand the cost savings calculations, we had some questions. Our questions revealed that there was an error in the spreadsheet they had provided. We were asked to disregard the information. We presented our concerns to the board at the September 25th meeting. If you would like to watch it - our presentation appears about 42 minutes into the meeting. If you choose to contact the board, you might also share why you value neighborhood schools, and ask them to take closure or repurposing of Roosevelt formally off the table. Leaving Roosevelt in limbo is not fair to the children, teachers, staff, and neighborhood. The uncertainty is damaging, our school is vital to the culture and well-being of our neighborhood, and the cost savings of repurposing the school are questionable. Older PostSchool Board to Provide Timeline.